Lots of people like chocolate fudge and other sweet treats, particularly around this time of year, when everyone gears up for holiday baking of all kinds. But between the mint-flavoured fudge, gingerbread people and, of course, the ever-present fruitcake, you might try cooking up this delightful chocolate candy from Brazil: the brigadeiro. After a feast of crispy fried coxinha, savory Bobo de Camarao, or any other delicious Brazilian dish, it’s time for the final and, what some people consider, best part of any meal. Dessert! 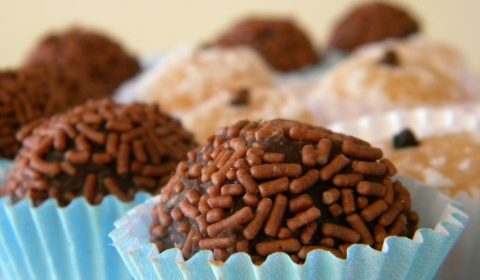 There is perhaps no dessert more mouth-watering, rich, and smooth than brigadeiro, a round, chocolate truffle famous for its sugary, decadent flavor throughout the country of Brazil. This treat was at one point only known by the people of Brazil, but now this confectionary creation is becoming popular in Europe and the United States – with good reason. This chocolate dessert can be enjoyed as a snack, a dessert after a big meal, or simply on its own. Brigadeiro is a staple of Brazilian cooking and culture, and its ingredients are just as rich and interesting as its history.